When I attended the Microsoft Professional Development Conference in 2009 (PDC 09), there was an “Oprah moment” during the keynote when we heard that we would each go home with a brand new convertible, touch screen laptop, loaded with the latest Microsoft software to play with. Here’s a picture of mine. 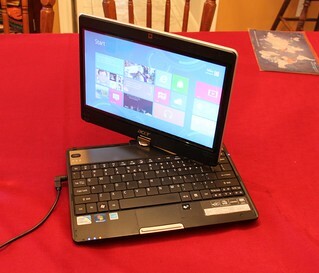 It’s a model 1420p by Acer, but it’s commonly called a PDC09 machine. I don’t believe it was ever sold publicly, though a few thousand were give to attendees of the conference. Over the last few years, this machine has served me very well, and I’ve upgraded the memory and hard disk so that it is a pretty decent little machine. Solid block sealed cases are very elegant, but it’s also very nice to be able to get inside and do some minor hardware upgrades. The convertible feature for this machine means that you can flip the LCD panel around and lay it down flat so that it becomes a nice two-point touch tablet PC. This is a very cool feature, and one that becomes even more cool now that the release candidate version of Windows 8 is available, since it works very nicely on a touch screen. Then, in the middle of a two-week trip to Beijing, the display suddenly stopped working. I could still use the machine by attaching it to with an HDMI cable to my hotel TV, so I could tell that the machine was still fine otherwise. The touchscreen even still worked, though it was hard to correlate the touch on my dark LCD with the image on the TV. 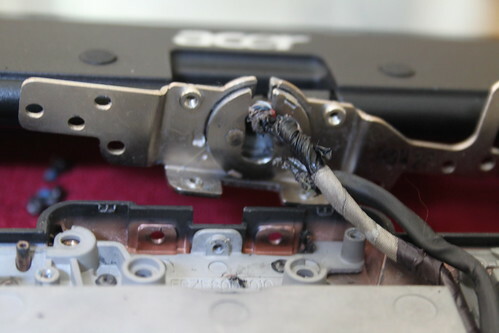 I wasn’t ready to give up on the machine, and I began to think (hope really) that the problem might be in the cable that connected the main system and the LCD display. I found a video cable for the system advertised on eBay, so when I got home, I placed an order. The video cable was a rather nasty looking beast, so I should probably have been frightened off. Here’s a picture of it. When I received it, I managed to find a system maintenance manual for the machine online. It was over 200 pages long, and it looked like replacing the video cable would mean disassembling most of the machine! Now I was really scared. If you want to take a look at the manual, it’s here. It turns out that the hinge is designed to turn 180 degrees in one direction, and then BACK 180 degrees in the same direction, but the stops on the hinge are not very strong, and it’s possible to keep on rotating in the same direction instead. It looks like over the years I had managed to do this a few times until the cables had been twisted and nearly snapped completely through. The video part of the cable had snapped already, and the touch screen part had managed to hold on. 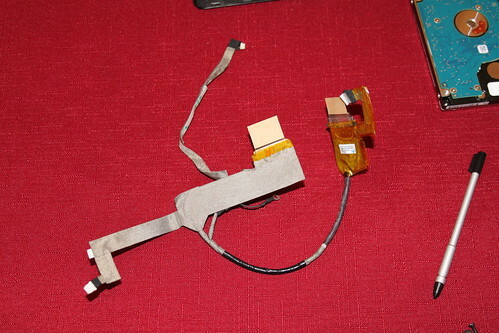 Also running through this hinge were four wires connecting the wi-fi/bluetooth radio antenna to the transmitter cards. This also explains why my wi-fi had stopped working. It had been the “canary in the coal mine” telling me another problem was coming, but I didn’t understand it at the time. IMG_6744, a photo by mike_knewtson on Flickr. Here’s the system after I was able to disassemble it far enough that I could actually replace the cables. Looking at the mess on the table, my confidence was getting pretty low that the thing would ever work again. Also, I couldn’t think of any way to test anything except to put it all back together again and hope, so I knew I was going to be investing bunch of hours before I would get any more information. Finally, I was able to get the new cable in place and start re-assembling, but I didn’t have a new set of cables for the wireless antennae, so I decided to patch in some small pieces of wire by soldering them in. Not much room in the case for excess wires, though, so I had to work a bit closer to the electronics than I wanted. here’s an intermediate view of this part of the job. No joy! The screen was still black. Sigh! I looked at the service manual one more time and tried some recommended trouble shooting techniques. One of them was to re-seat the memory modules (DIMMs). After reseating the DIMMs, all was well!!!! The machine lives again, the display and the touch screen work as before, AND the wi-fi is working again. Luckily, a happy ending, as there were many places the process could have gone badly. I’ve learned my lesson about how to flip the screen though. I won’t be rotating through my stops anymore, as I’d hate to have to repeat this process. Here’s one more shot of the machine. There was only one tiny screw lost in the process. Completely vanished. Luckily it doesn’t seem to be rattling around inside the case, so it was probably just eaten by the carpet. 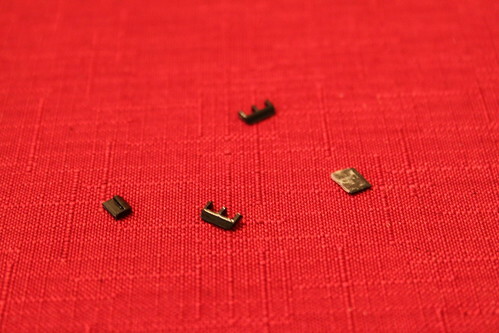 And these tiny plastic pieces seem to be orphans. I have no idea where they came from, but they can’t be very important. 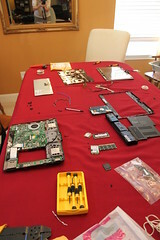 If you are interested in even more pictures of my machine in various disassembled states, you can see my Flickr set here. 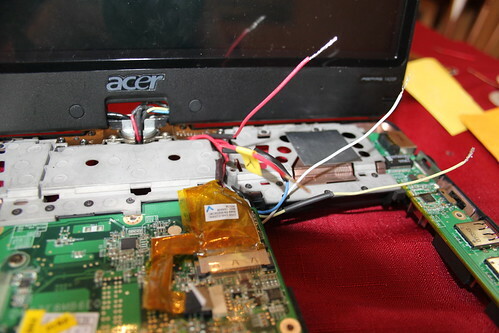 This entry was posted in Computer Technology and tagged Acer 1420p, Computer, Repair, Windows 8 by Mike Knewtson. Bookmark the permalink. 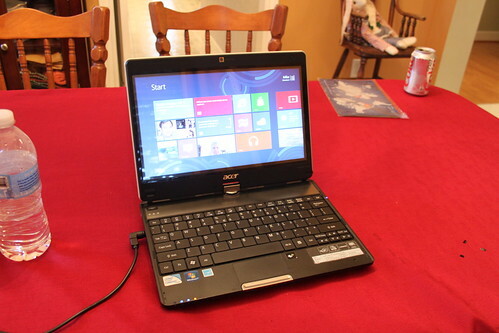 I also have a PDC Acer 1420p. Have you ever encountered the situation where the acer sees the wifi as switched off (as seen by Fn-F1), but the blue light for the wifi is ON? I am having no luck enabling the wifi. I don’t think I’ve seen this particular problem with my PDC Acer 1420p, though I have seen the Wifi have trouble connecting before, though mostly due to a weak signal rather than the OS not seeing the WIFI as enabled. At the moment I am running Windows 8.1 and am writing this post on the machine with WIFI connected. However FN-F1 doesn’t seem to do anything on this OS. The three-state light for wireless and the switch that below that has momentary push left or right to toggle modes has always confused me, I must say. I think it controls both the WIFI and the Bluetooth, though I’m not using the Bluetooth from this machine lately. Currently my WIFI light is ORANGE not BLUE, but the machine is working fine. At times because of the weak signal I’ve used a USB WIFI adapter on the machine, but not for the last few months. I guess my new home router must have a stronger signal. Keep me posted if you are able to figure out what caused the problem with WIFI on your machine.